It hasn't exactly been a long hot summer so far, but that looks to change soon. In fact, an extended heat wave is set to begin Friday. The heat and humidity get even worse on Sunday and Monday, with a potential triple-digit heat index. Showers and thunderstorms look to move into the area on Monday and perhaps remain into the Fourth of July on Wednesday, with more seasonal temperatures expected on the holiday. But forecasters say the heat looks to return by the end of next week and last through next weekend. On Thursday night, dry air moving into the region from the northwest should mean clearing skies and low temperatures in the 60s. In the city, and points south, some places may not fall out of the 70s. On sunny Friday, the heat and humidity begin to ramp up, with high temperatures in the low 90s and a low in the low 70s at night. 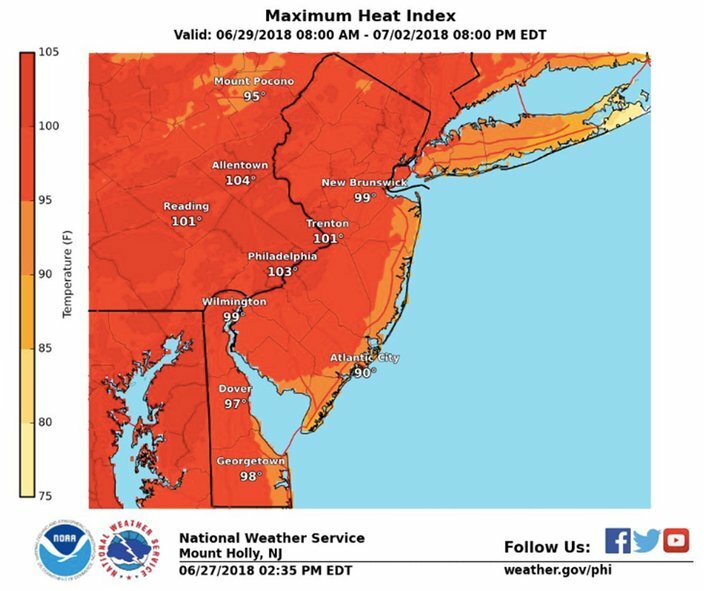 Temperatures rise to near 97 degrees on Saturday and a heat index approaching 100 degrees under sunny skies with just calm winds. The low will be in the mid-70s. A heat advisory in the I-95 urban corridor is possible. It gets hotter on Sunday. 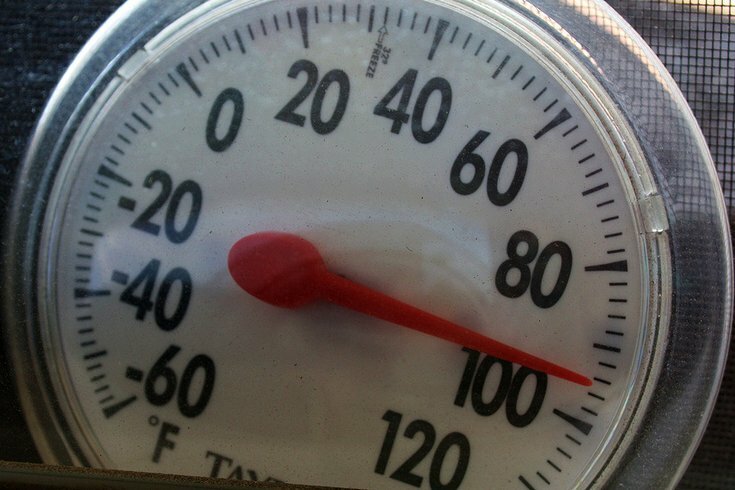 The mercury climbs another couple of degrees and a heat index of 105 looks possible under more sunny skies. The low will be in the mid-70s. A heat warning is possible. More of the same on Monday: sunny skies with a high around 97 and a heat index between 100 and 105. The low will be in the mid-70s. A cold front approaches. Temperatures dip slightly Tuesday but mostly sunny skies continue. High temperatures of 95 expected with a low near 74. On Wednesday, the Fourth of July, the high temperature falls to near 92, with a 30 percent chance of showers and thunderstorms. The mercury is expected to climb again later next week and continue through the weekend, forecasters said. Thursday night: Mostly cloudy, then gradually becoming clear, with a low around 71. Northwest wind around 6 mph. Friday: Sunny, with a high near 92. Northwest wind 5 to 9 mph. Friday night: Mostly clear, with a low around 72. West wind around 6 mph becoming calm in the evening. Saturday: Sunny, with a high near 95. Calm wind becoming west around 6 mph in the afternoon. Saturday night: Mostly clear, with a low around 75. Sunday night: Mostly clear, with a low around 76. Monday: Sunny and hot, with a high near 97. Monday night: Partly cloudy, with a low around 76. Tuesday: Mostly sunny, with a high near 95. Tuesday night: Partly cloudy, with a low around 74. Thursday night: Scattered showers and thunderstorms, mainly before 7 p.m. Mostly clear, with a low around 70. Southwest wind 5 to 7 mph. Chance of precipitation is 30 percent. New precipitation amounts of less than a tenth of an inch, except higher amounts possible in thunderstorms. Friday: Sunny, with a high near 84. Northwest wind 6 to 9 mph becoming southwest in the afternoon. Thursday night: Partly cloudy, with a low around 63. Northwest wind around 7 mph. Friday: Sunny, with a high near 84. Northwest wind 6 to 10 mph.